The Arab world had a long story telling tradition that far predated the introduction of Islam throughout and beyond it. Folklore and and stories passed down orally are known as the Adab tradition, and this work compiles many of those stories. The compilation occurred during the Islamic Golden Age, when artistic, philosophical, and scientific work thrived under the Islamic caliphates. 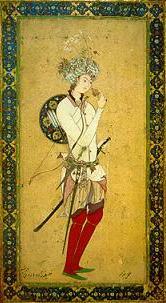 Harun al Rashid, caliph under which the Arab world thrived and One Thousand and One Nights was compiled.